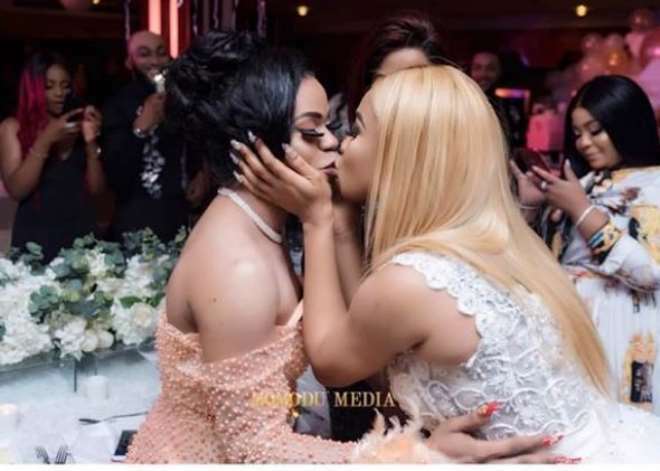 Controversial cross-dresser, Bobrisky, got a surprise gift during Nollywood actress, Tonto Dikeh’s birthday celebration as he was part of the guests that turned up to celebrate with the actress. Bobrisky while dancing with the actress got a surprise kiss from the actress who could not hide how much she appreciates his style and how he has managed to stay despite the various criticisms. Sharing the trending photos with his fans, he thanked the actress for accepting him the way he is as he promises his undying loyalty to the actress.